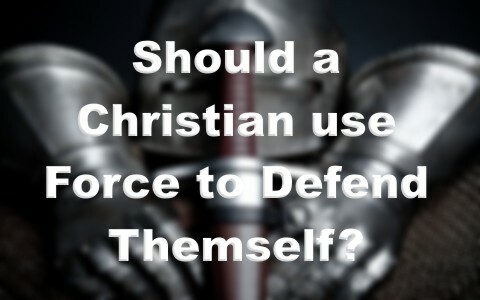 If we’re told to turn the other cheek, does this mean Christians cannot defend themselves? When Jesus said, “Do not resist the one who is evil. But if anyone slaps you on the right cheek, turn to him the other also” (Matt 5:39), did He mean we should just let people slap us, or even punch us? When Jesus was speaking, He was speaking in the context of how the children of God will live in the kingdom, but also how they should strive to live today. If you read the Beatitudes, I don’t do very many of these that often. How about you? It’s like the Ten Commandments to the nth power, so if we look at what Jesus is saying overall, we can see what He means. He does put this in the context of turning the other cheek or not being confrontational. Jesus then says, “And if anyone would sue you and take your tunic, let him have your cloak as well. And if anyone forces you to go one mile, go with him two miles. Give to the one who begs from you, and do not refuse the one who would borrow from you” (Matt 5:40-42). This is where we get the phrase, “Go the extra mile” from. Jesus expects us to trust God in judgment and not exact revenge, but return love for your enemies hatred, blessings for your enemies curses, and do good to those who do bad to you (Luke 6:32-36). Since Jesus was hated to the point of being murdered, then how do you think they’ll treat us? One lady was so despondent about her family persecuting her for her faith that she was about to give it up, but then, I reminded her of Jesus’ words, where He said, “Blessed are you when people hate you and when they exclude you and revile you and spurn your name as evil, on account of the Son of Man! Rejoice in that day, and leap for joy, for behold, your reward is great in heaven; for so their fathers did to the prophets” (Luke 6:22-23). See that? You are blessed by being hated, and more so when you love them back and pray for them. That’s what the children of God do (Matt 5:46)! I told this woman the Apostle Peter’s words, where he said, “Do not be surprised at the fiery trial when it comes upon you to test you, as though something strange were happening to you. But rejoice insofar as you share Christ’s sufferings, that you may also rejoice and be glad when his glory is revealed” (1st Pet 4:12-13), and “If you are insulted for the name of Christ, you are blessed, because the Spirit of glory and of God rests upon you” (1st Pet 4:14), so “let those who suffer according to God’s will entrust their souls to a faithful Creator while doing good,” (1st Pet 4:19). Whenever you are insulted or hated for your faith, “never avenge yourselves, but leave it to the wrath of God, for it is written, ‘Vengeance is mine, I will repay, says the Lord.”’To the contrary, “if your enemy is hungry, feed him; if he is thirsty, give him something to drink; for by so doing you will heap burning coals on his head” (Rom 12:19-20). If someone was a threat to the community, you know law enforcement officers would move in to try and protect lives. That’s what they do; protect and serve, so if they are trying to preserve life, which is a good thing, I believe Christians have a right to defend themselves. No believer should be a punching bag and quote, “Turn the other cheek.” Besides, that’s not the meaning of that verse. What if no one ever defended themselves? Smaller nations would be overrun, the rich nations would exploit the poor, and even though this has already happened to a certain extent, when nations take aggressive action against another, other nations will sometimes step in and defend the nation that’s being invaded or attacked. In an ever-increasingly violent world, we need to exercise every means available to keep ourselves and our families safe. Most people lock their doors at night as a defense against burglary, but if a thief breaks into a home and is stealing things, I am not sure that is worth taking someone’s life. If it all possible, you can defend yourself against intruders, but in most cases, calling 911 is the best option. Losing property is never worth taking someone else’s life, but when it comes to defending one’s own family, that’s when we are to defend ourselves and our families, by force if necessary. Whoever wants my wife and children/grandchildren, will have to come through me first. That is not sin, in fact, shrinking back and doing nothing to defend them, is! Each case is different. No two are alike. There is no “one size fits all” advice on how to defend your property and/or family. If families will do some preventative measures ahead of time, like good lighting, alarms, secure deadbolts and window locks, then a lot of crime will never happen. Jesus defended us. If you think about it, He took the wrath of God that we deserved. He suffered and died when we should have suffered forever, so if not for Jesus being our Mediator, we would have no protection from the wrath of God. You may not agree with me, but I am going to defend my family with every ounce of my fiber if they are threatened, but I’m not going to risk hurting someone or getting myself hurt to stop a thief for taking possessions that are going to burn up someday anyway. Things are never as important as people; even if it’s a thief. I’m sure the thief on the cross was glad that it was not too late for Him. Even though he believed just minutes or so from dying, he trusted in Christ, and never worried about doing works, and even though he never attended a church service, got baptized, attended a Sunday school class, or volunteered for vacation Bible school, he was saved. It is never too late to trust in Christ, because if a thief on the cross can be saved, then anyone can. Here is more from Pastor Jack: How Should Christians Respond to Bullying? Previous post: Where Was God During The Holocaust? Next post: How Can You Know Whether It’s God or Satan Speaking To You?